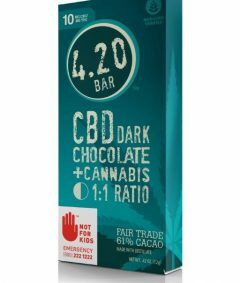 Your favorite 4.20Bar in a bite-sized morsel! Now offered in 1:1 THC:CBD for a balanced effect. Gourmet dark chocolate with a hint of sea salt. Fair Trade 72% Cacao. Vegan, Gluten-Free. All-Natural. Ingredients: Dark Chocolate (72% cacao beans, pure cane sugar, cocoa butter, soya lecithin, vanilla bean) Sea Salt, Cannabis oil.